Violent clashes break out as police stop Jewish activists from ascending Temple Mount; activists cry foul over clashes on Independence Day. Members of the 'Hozrim La'har' (Trans: 'Return to the Mount') activist group marched toward the Temple Mount Tuesday, demanding full Israeli sovereignty over Judaism's holiest site. Jerusalem police forces tried for several hours to stop the march, which was attended by dozens of teenagers and young adults. Police eventually stopped the march, after the group reached the Temple Mount through the Muslim quarter - by showing blatant police brutality. Two activists were injured and six were arrested for disturbing the peace. According to the group's Facebook page, one of the arrested was a fifteen year-old girl. 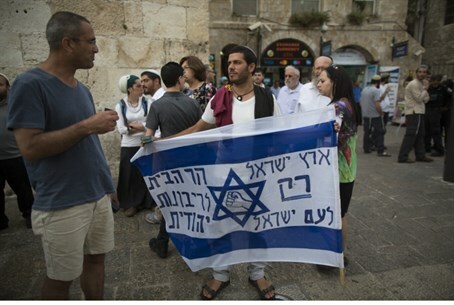 "It would be better if police blocked Arabs' entry to the Temple Mount and did not prevent Jews from exercising their right to pray there," activists told Arutz Sheva Tuesday. "Today we celebrate 66 years of Israeli Independence - but not on the Temple Mount." Earlier Tuesday, several groups of Jewish visitors were allowed to ascend to the Temple Mount in honor of the national holiday - being treated relatively well for the first time in months. Israeli police, in an attempt to appease the Muslim Waqf which was left in charge of the compound after the 1967 Six Day War, ban Jews from praying or performing any other form of worship.